Personalised medicine with mTOR inhibitors and Telomerase modulators may serve as important breakthroughs in medicine. May be it can fetch more attention of organisations like Cancer Research UK, NCI and other funding agencies help in fighting Cancer and Ageing related problems. mTOR is nutrition driven pathway. 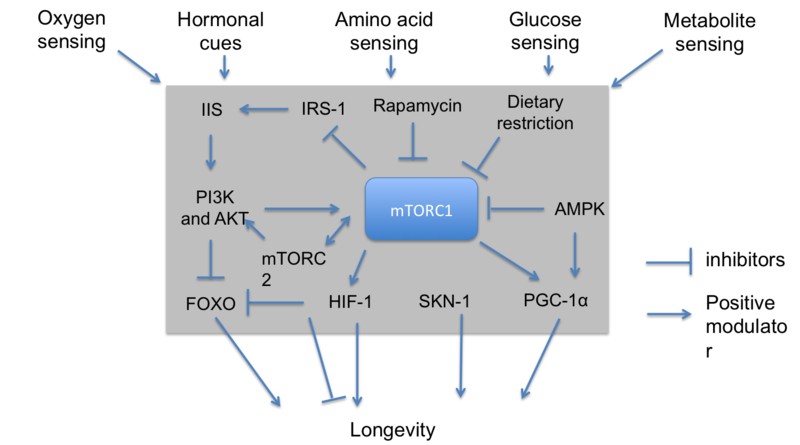 Dietary restrictions causes down regulation of mTORC1 activity. Hence, targeting it with its inhibitor may help in providing anti-ageing and anti-cancer effect as shown in figure below. 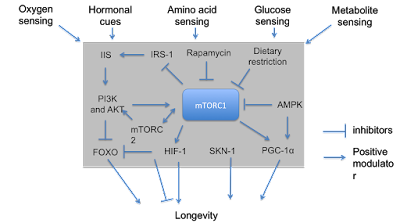 It shows effect mTORC1 effect on longevity. A cancer cell needs lot of energy because of its increase growing rate. Inhibiting mTORC1 with specific inhibitor helps in providing longevity. According to Peto's paradox, chances of acquiring cancer is more in humans compared to large animals like elephants or whale even though these big sized animals have large number of big sized cells compared to humans. It's observed that small number of cells divide faster than big sized cells. As a result there are chances to acquire large number of genetic errors in rapidly dividing small cells. And these errors simply keeps on accumulating due to cell division. These accumulation of errors leads development of cancer. Moreover, with every cell division Telomere located at the end of DNA also keeps shortening. So basically with every cell division a piece of information is lost due to DNA damage. Telomerase enzyme helps in prevention of this loss and maintains the Telomere length. This in turn helps in maintaining the original length of DNA and prevents chromosomal shortening. Details of this basic biology can be visualised in following Youtube video. Identification molecules which can increase synthesis of telomerase has been of prime importance. These agents can also help in reversing ageing or may be useful for cancer prevention. Understanding of how telomerase works can be seen from a video of famous scientist Prof. Michio Kaku. A Guide to Free Genealogical Resources has emerged as a widely recognized hobby among many human beings. Most people pick to adapt their studies through going backward thru time. Others choose to begin their genealogical studies by using way of documenting and connecting with loved ones/folks that are presently alive.